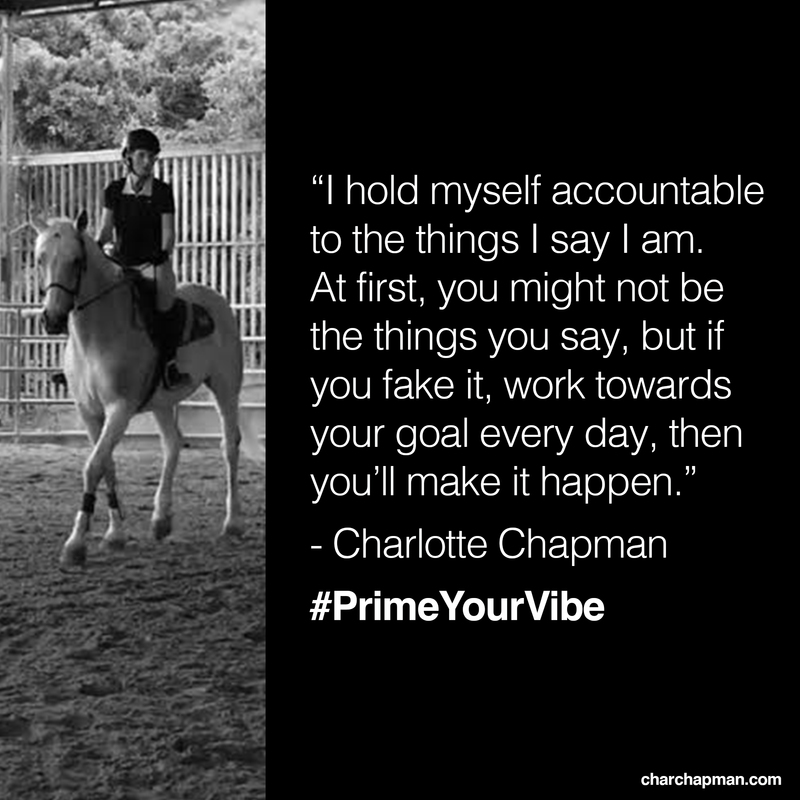 I applied Prime Your Vibe to my equestrian training this past year and had a huge increase in growth and accomplishing my riding goals. I wanted to share with you some tools and practices that I use for setting goals. I was able to work towards several of my major goals from last year for both personal and business. It’s best if you know your Why factor (which I discuss in a previous post here). I completed a one year, five year and ten year vision plan for my life, with my career being one of the corner stones, along with health and personal goals. This is based on the idea that in ten years anything is possible (if you work towards it). And what’s great about this is that you can change it at anytime. These are goals that you are setting for yourself, not anyone else. I used a blueprint that I found on Lululemon’s site last year. What I like about this worksheet is that you have to write out actionable items for each span of time to reach your goal. An example is articulating what you need to do in one year to reach your five year goal. Setting goals creates actionable items that you have to act upon in order to reach them. Now you just have to set yourself accountable for reaching those goals. What is Prime Your Vibe? This is when I tell myself that I’m A, B, C, D. It’s usually the long term goals that I’m working towards from my blueprint, with an affirmation spin. I hold myself accountable to the things I say I am. At first, you might not be the things you say, but if you fake it, work towards your goals every day, then you’ll make it happen. I spend maybe two to three minutes on this at the most. An example of a way I used this was for my equestrian training. I told myself I was an equestrian who knew how to jump and within six months I improved significantly in my riding foundation and was able to jump poles while riding a horse. Granted, it was hard, but I did it. I watched pro riders ride, training videos the night before / the morning before my riding lesson, and maximized my training with my trainer Stephen Pellett by getting proper nutrition, eating, etc. I also made sure to take good care of my partner, the horse, with proper grooming before and after each lesson. When I set my goals last year, I wanted to become a human centered design expert. When doing Prime Your Vibe, I told myself every day in the morning that I was a human centered designer. I took a class early on in the year on Design Thinking and applied what I learned to my art. I also read numerous books, took notes, and decided to write a book on what I’ve learned as a blueprint for myself and other designer friends who want to learn more, but don’t know where to look for resources (which is currently in progress). In November, I went to a workshop on Design Thinking in action, which exceeded my expectations and turned out to be one of the best experiences of my life so far in regards to propelling my career’s growth. Remember, when making decisions, always ask yourself if you are working towards your goals or moving away from them. You always want to create action towards your goals. Happy goal setting! How have you applied Prime Your Vibe or similar principles? Share below in the comments and hashtag #PrimeYourVibe !